Arnold Schwarzenegger is a prime example of how much you can accomplish with blind, raw, "take-no-prisoners" ambition. After establishing himself as an Austrian bodybuilding champion in the early 60s, and winning the title of "Mr. Universe" in 1967 and 1968, he moved to the US with the dream of becoming an actor, and next to no English-language ability. Over the next nine years, he improved his English, earned his Bachelor's degree, wrote a bestselling book, and won just about every bodybuilding title he could. He began acting in the early 70s, and won a Golden Globe for his work in his second film. However, it took until 1982's "Conan the Barbarian", before audiences really took notice of him. 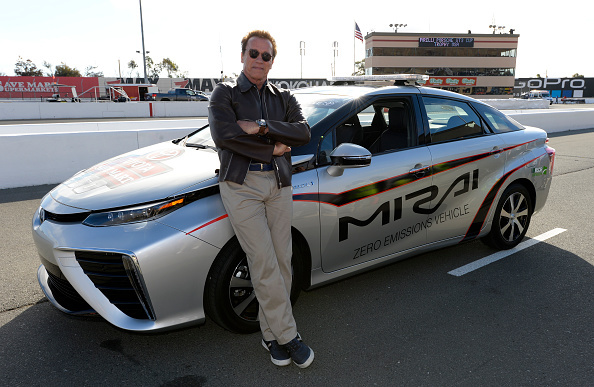 From there, it was a short trip to "The Terminator" franchise, a massively successful career as an action star, a politically savvy marriage to Maria Shriver, the niece of John F. Kennedy, and finally eight years as Governor of California. Recently, he has been laying relatively low, after the very public revelation that he fathered a child with his housekeeper, and the subsequent dissolution of his marriage (and his credibility). This has not stopped him from stepping out on the town in a head-turning car, however. Arnold Schwarzenegger has been tooling around Los Angeles in a new Mercedes-Benz Unimog. Not exactly the most chilled out vehicle on the planet, the Unimog is closer to a luxury tank than anything else. Manufacture of the Unimog began just after World War II, and very few people drive them as recreational vehicles. Originally designed to act as high-speed tractors, they are now commonly used by various militaries, fire fighters, safari and expedition groups, as municipal vehicles for snowplowing and construction, and in off-road or rally races. The U20, the version of the Unimog that the former "Governator" drives, has the same frame as the standard U300 Unimog, though slightly shorter, and sports a cab over engine compartment most commonly found in an Accelo truck. The vehicles have high ground clearance and flexible frames that make driving on uneven terrain considerably more comfortable. Why Arnold needs that in Los Angeles, we'll never know, but more power to him. Steering can also be changed from left to right. The car/tank comes with a 2.8-litre M130 petrol engine which produces up to 185 horsepower. It's a ridiculous vehicle to have in the city, but it somehow suits everything about the man who has been "Mr. Universe", Conan the Barbarian, the Terminator, and a Governor.